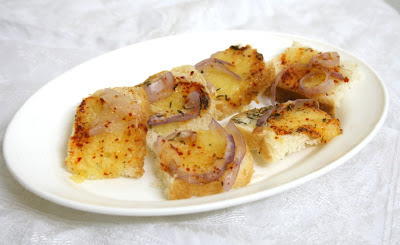 Look what the lovely Srivalli from Spicing Your Life sent in for MEC: Party Appetizers.. a very yummy Cheese Toast with Thyme, Red Pepper Flakes and Roasted Onions! This is a dish that is sure to please your guests! Looking forward to seeing all your concoctions in the microwave! Check out my post on MEC: Party Appetizers for more information. Yum Lav, looks superb !!! @ Priya - Thanks Priya! Its all Srivalli! @ The Kitchen Affaire - Hi! Do try it out and let me know how it comes out! Perfect for sudden guests!